Man, were we wrong! 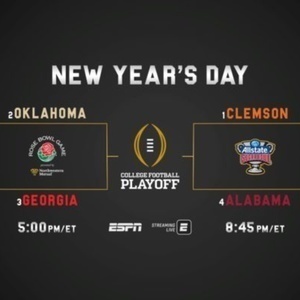 Back in the late summer (episode #23 to be precise), we made our College Football Playoff picks, choosing Ohio State, USC, Florida State, and Alabama as our final four. Well, we only got one team right, but I think overall, we have a much better, more competitive, and more entertaining final four than we previously envisioned. So, congrats to the fans of Clemson, Oklahoma, Georgia, and Alabama. This week’s episode looks at selections from Tuscaloosa, Clemson, Athens, and, since Panic has never played in Norman, Oklahoma, we shift over to Tulsa for a solid show from summer 2000. Along the way, we give our pop culture recs for the week, Harvey rants about the fancy college dorms that kids have these days, Jeff says the Big Ten was better off missing the playoff this year, and, of course, we wish everyone safe travels, a Happy Chanukah, and a very Merry Christmas. We will be off on 12/26/17, so we’ll see you all again in 2018!